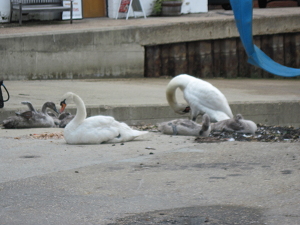 We haven't seen the swans at Trafalgar Wharf for a couple of weeks but today they arrived for a visit. They have five healthy signets that are growing fast. Maybe they have come back for the BBQ at The Drystack tomorrow. Fingers crossed for some nice weather.